Skype is probably the most used messaging platform on computers. Acquired by the tech giant Microsoft, gained an even bigger space and is now a key part of the company. As part of its improvements and natural developments, Skype has now announced a novelty that everyone asked and expected. Now no longer need to create an account to use this feature. Many want to use Skype and do not have access to their account, either because they are on other computers, either because they can not download the application or simply because they want to have a conversation without sharing contacts. Until now this was not possible, but now it’s over. Skype announced that anyone can now use the service as a guest. To create these temporary chat rooms, only need to access Skype.com and create a guest account. Immediately it will provide a link that can be shared with other contacts as well simply to enable messaging, voice / video calling, and screen sharing, all free without an account. These rooms ensure all free features, allowing to have conversations with other users, up to 300, or video or voice conversations, up to a maximum no. of 25 users. File sharing and screen is also available as we already told. The duration of these chat rooms will have a maximum time of 24 hours, and then permanently they will be deleted. 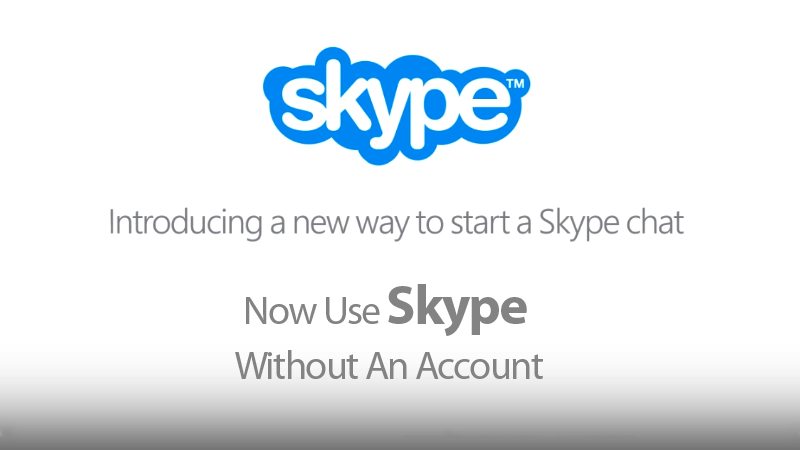 If they wish to extend this time then user have to simply create a Skype account. All additional features, such as voice calls to the fixed network and mobile numbers are left out of this plan, as they are not available to guests. There is also the obligation to use the web version to use this new feature. Skype has evolved and now become much better. As its integration with the Microsoft operating systems is increasing and even outside of these platforms has grown even on platform like Linux as well.